Turner Classic Movies (TCM) recently aired the 1947 film noir entitled “The Unsuspected” with the brilliant Claude Rains. When the hero takes the train into Manhattan an establishing shot of Grand Central Terminal is shown. You see the front of the terminal and the Park Avenue Viaduct in the scene. Turning left unto 41st Street under the viaduct we see one Surface Transportation’s TDH-4507, with those large protruding headlights, directly in front of it is another Surface bus already under the viaduct on 41st Street. The question is… Was this a rush hour short turn for the M104 and/or M106?? I’ve searched all my Surface Transportation maps, as well as the Motor Coach Age issue dealing with Surface Transportation and nothing is mentioned about this “deviation”. The fleet number and the route sign are not very clear. 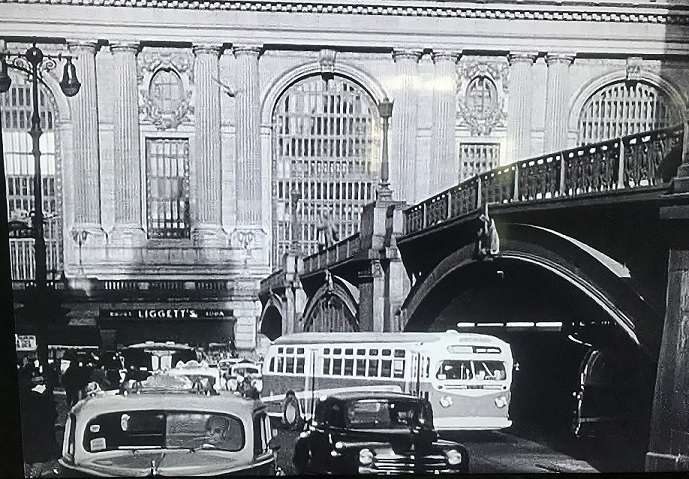 Besides the Surface Transportation buses and taxis, if you follow a direct line below the Liggett's sign you can see the top of a Carey Transportation Flxible Clipper loading passengers from the Eastside Airline Terminal that was located across the street from Grand Central. You got to love those old street lights! Memory, not research, speaking. I think it was the M-104 that often short-turned at GCT. I am quite certain that the 42nd Street Crosstown went all the way east. In the blackout of 1965, Dad's composing room work on West 52nd Street ended at 6:15, so the staff already had commentary from battery radios. Dad caught a southbound M-104, rode to the Tudor City turnaround (or whatever it was), kept his seat until the garage at 129th and Amsterdam, then caught an M-100 to Marble Hill. Meanwhile, his cousin Margaret was on a BMT Astoria train under the East River. From then on, she took the bus to work. That Carey stop across from GCT was actually the Airlines Terminal...the East Side Airlines Terminal was located on the block between 1st and 2nd Avenues, 37th and 38th Streets, near the Queens-Midtown Tunnel. It was a beautiful art-moderne styled building, with off-street bus loading, and occupied by most of the domestic and many of the major international airline ticket offices. It did not last long, mainly because the newer buses ('buffalo type') were too tall to enter, so Carey used several hotel pickups instead.